So many scents to choose from! When I started Alegna Soap® I wanted to make everything and buy every essential oil I could.. I knew that moving from a hobby to a business would be challenging, and one of the hardest things to choose was which essential oils to use for my soaps. I needed oils that would play well with others and blend nicely. These are my 10 favorite essential oils for soap making and what I like to blend them with. Some of them do well in threesomes. And foursomes. 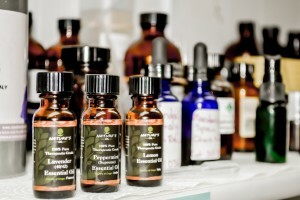 Try lavender, anise and orange, or tea tree, peppermint, eucalyptus and rosemary. Play around with them. I smell the caps together. If one oil overpowers another, I hold the one cap a little further away and smell. if it smells good I use less of it in proportion to the other. Not a very scientific way, but it works for me. Do you have a favorite essential oil blend for soap? I love mixing lavender and orange in my essential oil diffuser. When I had my Etsy shop, I mixed lavender and lime in my men’s shaving soap. It was my most popular item. One of the reasons I love lavender so much is that in soap it blends so well with everything. Thanks for sharing Donna. I don’t think I’ve ever used anise. Thanks for the suggested blends with it, now I might try some. I love anise Cindy. Just a small amount makes the blend smell totally different. I’m always careful not to use too much because it can be overpowering. Let me know what blends you come up with. Lots of great suggestions for blends – thanks! I’m glad you like them Pat! Thank you for this list. It is so helpful, to know what to mix, with what. My favorite EO mix is Chamomile and Neroli. It is the most relaxing, yet pretty scent. It’s so much better than Chamomile with lavender (although good). It’s a wonderful Essential oil blend to try. Thanks Barbara, I’ll have to try your blend! I have seen Lavander EO not survive cold process. I like my soap with medium to strong fragrance. I have wasted many lavender EO bottles trying to have more fragrance, fruitless. Any suggestions? I find that lavender eo doesn’t give a strong fragrance throw alone. It doesn’t have a strong scent intensity. You can try using a lavender fragrance oil, it may smell similar to the eo, but not exactly the same. You can also try using a clay in your soap recipe to help anchor the scent, that might help too.